"Ehud Olmert will be Prime Minister one day. Unlike most politicians, he knows how to get things done and administer. 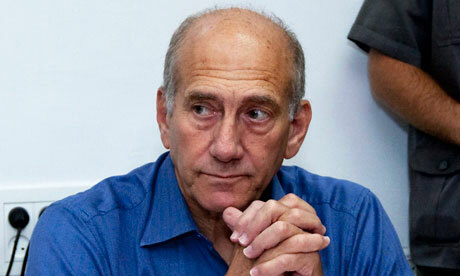 Olmert does more than just talk." OK, I was mostly right, but never in a million years would I have predicted that he'd veer so terribly Left and end up not only spearheading the dastardly Disengagement but then be charged and convicted for corruption. From Biblical times until today and no doubt the future, too, there have always been leaders with their hands caught in the till or in somebody's pants... Their reactions are the way we end up judging them for posterity. The Biblical King David admitted his crime and fully repented, saying he "sinned before Gd" and was not only forgiven but has always been held up as an example for good. On the other hand of this spectrum, we now have Ehud Olmert who refuses to admit to any guilt at all. So repentance isn't on his menu. That makes him even worse than the Biblical King Saul. That is a bad precedent and makes him a dangerous role model.